Mobile Car Care offers high quality tire repairs performed on location. All the equipment required to perform the repair in a safe and robust manner can be found on board our Mobile garage. We do not offer ‘quick and cheap’ repairs, done from the outside of the tire. This method is unsafe and illegal. 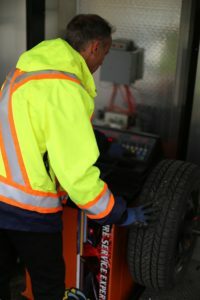 Our method requires the tire to be removed from the rim. We remove the inner liner in the area of the leak and buff it with special tools. Only very small leaks (for instance a thin staple) are fixed by means of a patch. Larger leaks are properly drilled out and a plug patch is applied with vulcanizing compound. Lastly we restore the inner liner with a specialized compound. Small leaks from the bead/rim area are usually caused by corrosion. We thoroughly remove the corrosion to restore a proper seal. We can also provide you with a custom repair quote for other work, just contact us! © 2019 Mobile Car Care All Rights Reserved.